Ahi is a very precious fish in Hawaii. The beautiful yellow fin tuna is a prized catch, mainly because it’s the most essential ingredient in the widely popular Hawaiian delicacy known as poke. Hawaii is famous for many specialty comfort foods like SPAM Musubi or the loco moco, but all Hawaii culinary inventions bow to POKE. Before we get started with anything else, I’ll quickly go over the basics of what Hawiian poke really is. I’m sure you’ve all had Japanese sushi and sashimi – raw fish. Well, poke is the Hawaiian version of raw fish sashimi. Instead of thin neat slices of fish like the Japanese prepare, in Hawaii the raw fish is cubed into chunks and marinated in a variety of different salty flavors. 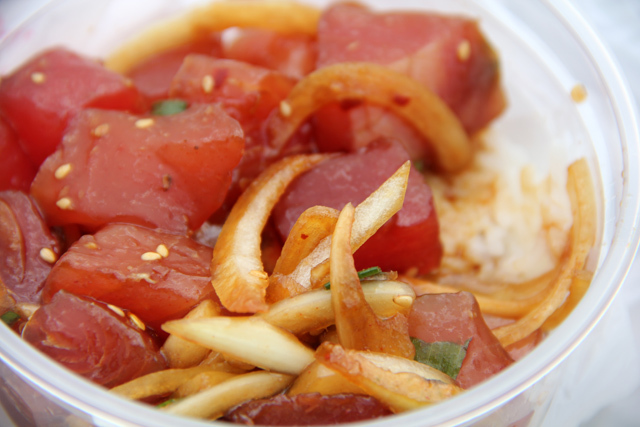 The most popular versions of poke is a combination of raw fish, sea salt, soy sauce, limu seaweed, sliced sweet Maui onions and fragrant sesame oil. Nowadays though, there are different fancier versions of Hawaiian poke that include things like wasabi or flying fish eggs. Whenever I come back to Hawaii from living in Thailand, poke is one of the dishes I look forward to most. If you’re also a fan of sashimi, there’s no doubt in my mind that you’ll absolutely love poke too. When the fish is fresh and high quality, poke is one of the most pleasing sensations your mouth will ever encounter. The fish should be tender like pieces of ripe papaya – it should barely even require chewing! The soy sauce and mild spices aid in complementing the poke so the additions are not overpowering but the natural flavor of the fish still comes through. What was once a traditional Hawaiian dish, has been adapted to the many cultures and influences present in Hawaii from around the world. These days, Hawaiian poke is a fusion of Asian flavors combined with Hawaiian culinary expertise – and poke is absolutely spectactacular! 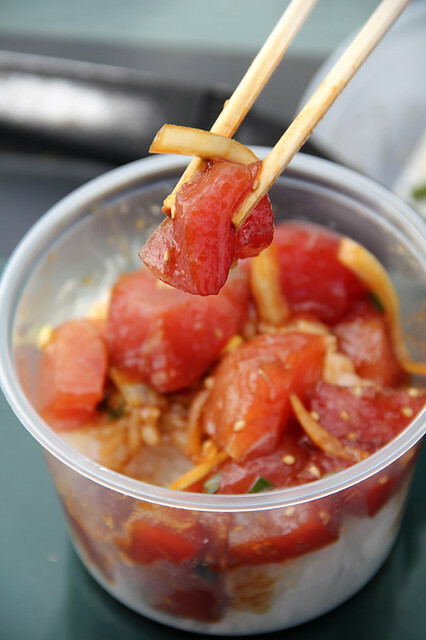 Hawaiian poke is normally served for takeaway – a leading dish in the take-out beach side dining scene. Various convenience stores or grocery stores throughout Honolulu and the rest of the islands serve poke by the pound. Frozen fish is often in the $8 – $10 per pound range while fresh local fish normally costs $13 – $16 per pound. 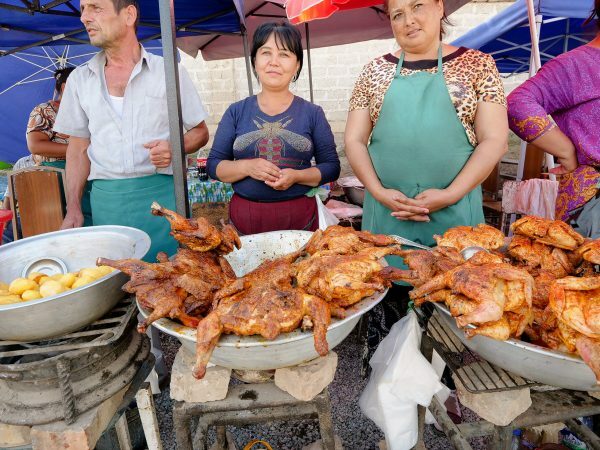 However, fish prices can fluctuate due to the heavy demand and the lessening supply. 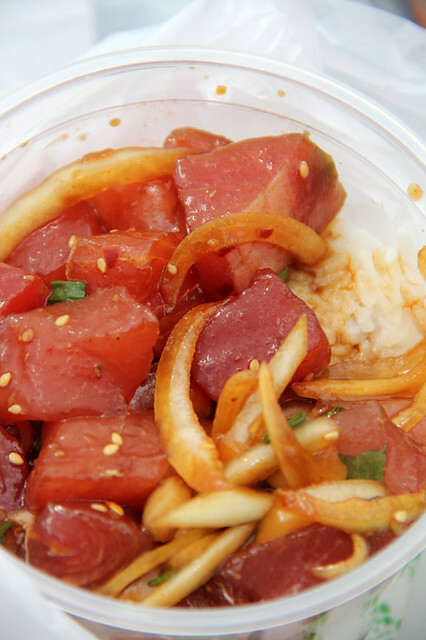 The next topic we’re going to discuss is the Hawaiian Poke Bowl, a genius invention of steamed white rice topped with fresh poke all stuffed into a takeaway plastic container. 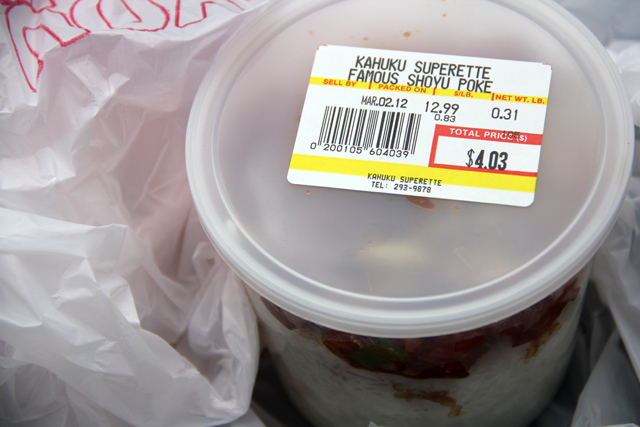 Poke bowls are available throughout Hawaii, but one particular place that’s famous for its rice and fish is a little convenience store known as Kahuku Superette. From the outside, Kahuku Superette looks like just an average liquor store – and I don’t think there’s even any indication of poke or food from the outside. 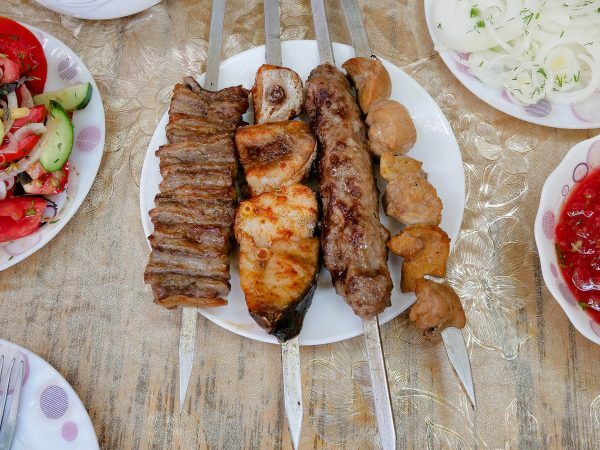 It’s one of those places like the Zanzibari Mix stall, you’ve just gotta know they serve delicious food! Walk inside and you’ll see the normal fridges full of beer and the salty array of American snacks. But just like Alicia’s Market in Kalihi, if you walk to the back, you’ll be in an entire new world of Hawaiian gastronomy. Choose small, medium, or large sized rice, and as much poke (sold by the pound) as you want, and it will all be packed into a plastic container. The shoyu poke is the classic, probably the most popular version – $12.99 per pound. I ordered the medium sized rice plus 1/3 pound of the shoyu poke – I regret that I didn’t double or triple my bowl size (next time). It was one of the most satisfying poke bowls I’ve ever had in my life. The fish wasn’t too salty and the onions were superbly flavorful and just pungent enough. One of Oahu’s great poke bowls rests inconspicuously behind the aisles of liquor and beer at the Kahuku Superette. 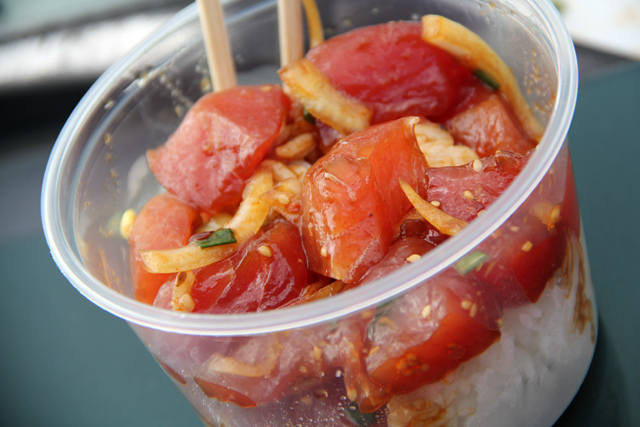 If you’re ever driving around the island of Oahu and cruising through Kahuku, grabbing a poke bowl is a requirement. 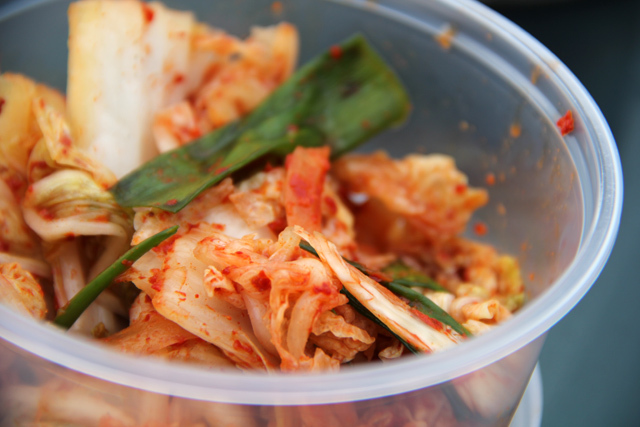 I’d also recommend a side of Korean style kim chi, it goes so extremely well with the rice. If you go to Kahuku Superette, prepare yourself for an ambrosial Hawaiian poke bowl that will melt in your mouth and change your life forever. Be warned, you may dream and drool or their poke for days after eating it (I’m still dreaming). My wife and I were there in September 2019 and were introduced to the Ahi Pole at the Kahuku Superette by a local. It was absolutely delicious. We are returning to the North Shore in February and will definitely get more! We just moved to Laie from Oregon. Have long been a fan of sushi and sashimi. Laie is just south of Kahuku and went by the Superette and got me about half pound. It was wonderful. I got the shoyu flavor. They also have one in a mayo/pepper sauce one I’ll try next time. 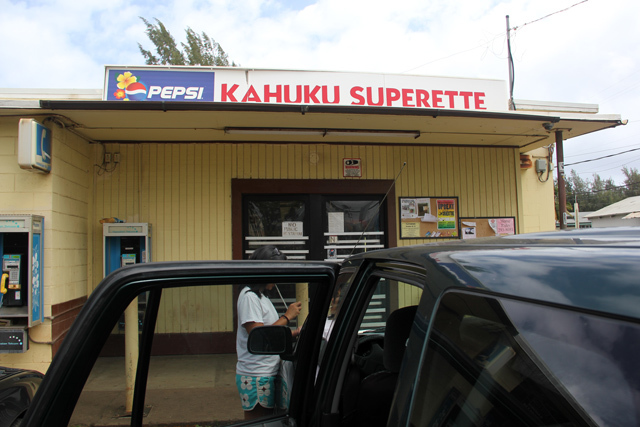 Hey Jabes, good to hear from you and that you love Kahuku Superette too! Foodland Markets on Maui serve fresh poke behind the deli counter. GREAT !! Since our last trip there, the wife has been maki poke here at home and her’s is EXCELLENT !! Poke is just good food. Hey Marty, thanks for the tips. Glad you love poke too! I had never had poke before moving to Alaska, and when I first tried it, I was hooked! I would get buy it quite frequently. Unfortunately, I don’t know of any places that sell poke in HK. 🙁 I guess I’ll have to visit Hawaii! Hey Laura, wow they had poke in Alaska too, that’s great! It looks like a good kind of food…I really want to try it because it looks delicious..
You know, I’ve had this before and had no clue that it was Hawaiian… Always figured it was Asian in origin. It was so tasty! Cool to hear that Aaron and glad to hear that you liked it! I looove sashimi, so I guess I will find no trouble at all eating poke (probably I will love it as well). But kim chi is not my thing. So I’ll just stick with poke one day when I go to Hawaii. That’s a great plan Bama! Next time we are in Oahu (which I hope will be soon), we will make a point of trying this. Scout’s Honor. Yes! It’s a must stop poke place! If you enjoy poke or raw fish, this place is wonderful! I’m not a sushi or raw fish person, but this actually looks really good. 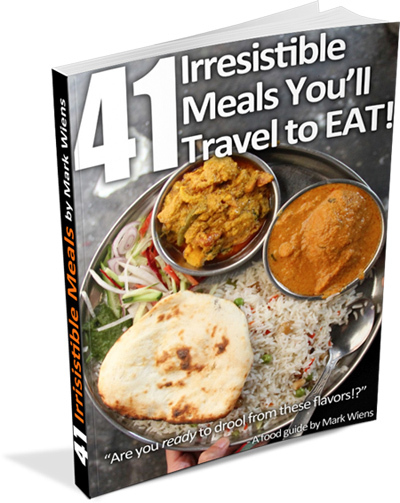 Something to add to my checklist for when I visit Hawaii! Great, Hawaiian style is a fantastic way to eat raw fish! I’ve never heard of Poke before and I definitely missed it on my last visit to Hawaii! It sounds delicious. 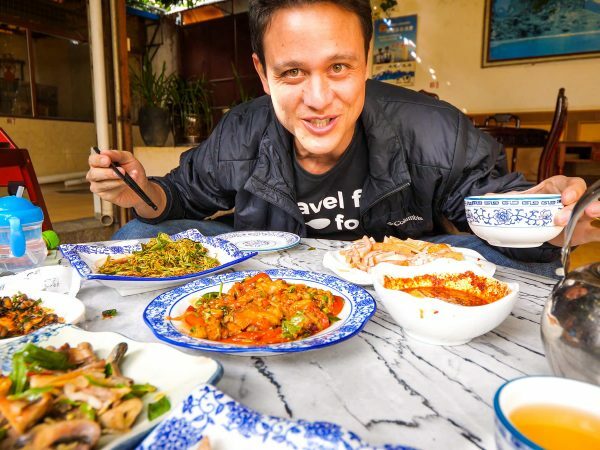 It’s a really spectacular Hawaiian dish John, hope you can grab some next time you make it to Hawaii!